Ah the renaissance… a wonderful time of art, politics… and gem mining? 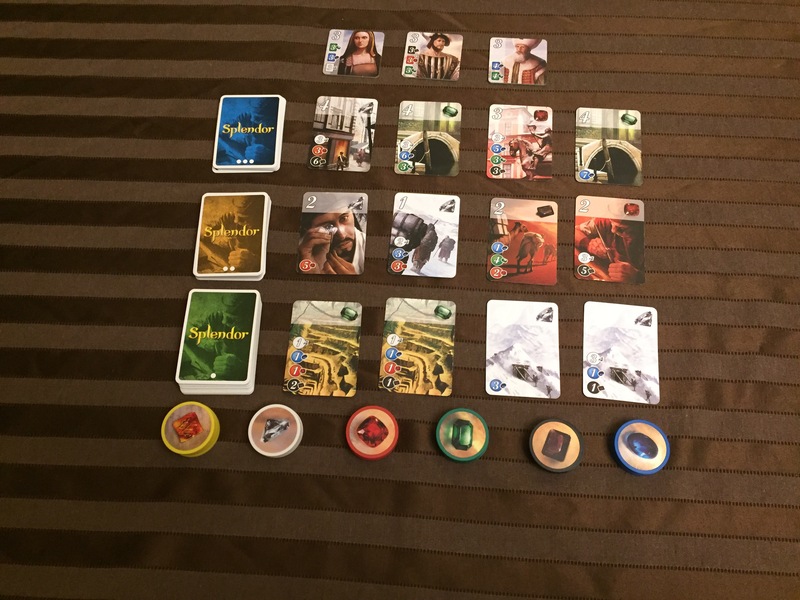 Splendor is a card and chip collecting game in which you collect gems which allow you to buy bigger and better gems until you earn enough prestige. Gameplay is smooth and tactical, and the objective of the game is to be the first player to reach 15 prestige points. Inside the box there are 40 gems (7 in 5 colours plus 5 “wild” tokens), 90 cards (40 level 1, 30 level 2 and 20 level 3) and 10 noble tiles. The artwork is great, and the quality of the components are top notch, especially the chips. However, the theme of the game is kind of flat. You don’t ever feel like you’re this merchant mining gems. You could have put any theme on this game (like mining in space or farming crops, who knows) and it probably would have worked just as well. But that doesn’t matter… because the gameplay is where it really shines. To set up, you begin by setting up the cards in 3 rows (one for each level) and revealing the top 4 cards. Then you set up the chips depending on player count (4 of each for 2 players, 5 for 3 and all 7 for 4) except for the gold chips. They are considered wild and all 5 come out regardless of player count. Then you reveal the noble tiles, always one more than the number of players (ex. For 2 players you reveal 3). And set them up above the cards within view of the players. For your turn, you choose one of 3 available actions. The first action is you can take chips. The rule is you can take 3 chips as long as they are all different colours, or 2 chips of the same colour provided there are at least 4 left in the stack. The second is to buy a card on the table and place it in front of you. The third option is to take a card in your hand (or reserve it) for future purpose and take a gold chip (which counts as any colour in the game). The cards have 3 things on them. On the lower left, there is a cost (in the card above, you must have 3 blue gems, 2 red and 3 black to purchase it). On the top right, each card has a gem value. As you buy cards, you place them in front of you and get that gem for the rest of the game to use for your purchases. As you gain more cards, you will be able to buy more expensive cards through the use of both cards and gems (or sometimes just through the cards you have already purchased). The last feature on the top left (though not always on each card) is the point value of the card. Wouldn’t you want these guys to visit your gem empire? The other ways to score besides cards are nobles. Nobles will come to visit if you have enough prestige… which is a fancy way to say that the first person to have the corresponding cards on the left side of the tiles gets that tile which is worth 3 points. So for the tile on the left, the first person to get 4 blue gem cards and 4 white gem cards gets 3 points and takes the tile. In a game where the victory condition is 15 points… thats a lot of points. And the game comes with 10 nobles, which means that they’ll be different each game. One thing I want to go back to is the 3rd action, which is taking a card in your hand and a gold chip. That’s a great way to take a card that you can’t quite afford yet but need before your opponents can take it. Alternatively, its a great way to take a card you know your opponent is going to buy and frustrate them and make them re-think everything. I know it’s mean… but its also fun. Plus it’s the only way to get those gold chips. Splendor is one of my favourite games. Simple and easy to play, and just as easy to teach, it comes to my table quite often. It’s one of the easiest games to teach people who don’t game, yet has so much strategy and tactics that experienced gamers will appreciate it’s depth. 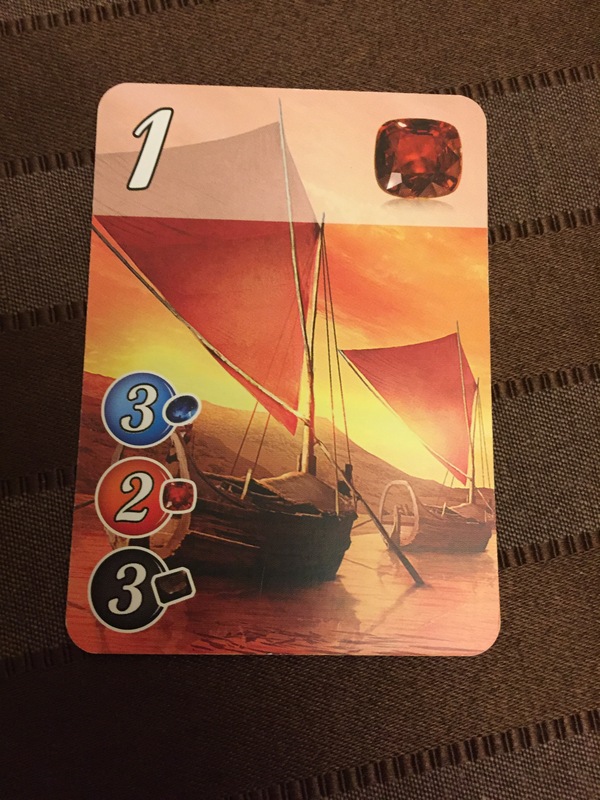 I don’t know how many times we finished a game and the consensus was “One more?” I find it best with 2 players, but it plays great with 3 or 4 as well. This game comes highly recommended.